It's New Year's morning—you've got a champagne hangover and half an ill-advised Meat Lover's pizza on your nightstand. What could possibly make this day better? For some, it's jumping into an ice-fringed ocean. But why, you ask? In many cities, the annual polar bear plunge is a centuries-old civic tradition, a large-scale display of collective stupidity. There are those who claim subjecting the body to subfreezing water has numerous health benefits, while other adherents have a more spiritual connection to the act, seeing it as a Jackass-esque way to baptize the new year. Of course, it's not enough just to submerge your body under ice water for a few minutes anymore—many of the events have begun a "freezin' for a reason" policy, requiring registration and donations to raise money for charity. Whatever motivates you to get out there, just remember the old New Year's adage: He who has the smallest balls, wins. The Coney Island Polar Bear Club claims to be the oldest outdoor bathing organization in the U.S. The group was founded in 1903 by Bernarr Macfadden, an early fitness guru who believed that swimming in a cold ocean during the winter boosted "stamina, virility and immunity." This annual New Year's Day dip is in addition to the regular swim that the club takes every single Sunday from November through April. 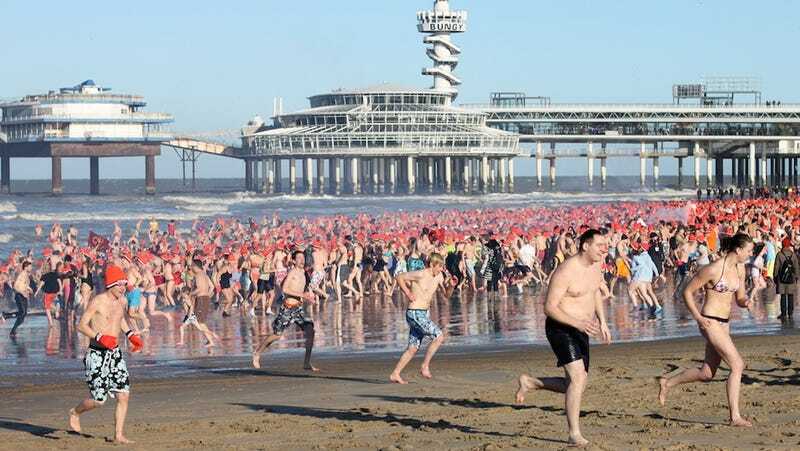 About 10,000 people dive into the sea at this Dutch resort on the coast, but an estimated 30,000 people will be doing the same thing in different bodies of water around the country. The Nieuwjaarsduik ("New Year's dive") has become somewhat of a national event and even has an official corporate sponsor, Unox, which gives out branded hats and gloves at different locations. The city's Polar Bear Swim has been happening on New Year's Day since 1920. About 2,200 swimmers run into English Bay, some of them participating in a 100-yard race beforehand. According to records kept every year, this is one of the warmest cold-weather plunges. The water temperature has been measured as high as 48 degrees, which is downright balmy, especially when it's about the same temperature outside. The New Year's Day Loony Dook is preceded by a parade through the town, with the elaborately costumed "loonies" making fools of themselves as they head down for the "dook." It's estimated that about 1,000 people take the plunge, but many more show up to show support. From looking at the photos I would guess many of them are most likely still drunk from the night before. Are you engaging in a polar bear ritual on January 1? Let us know about your favorite icy plunge in the comments.